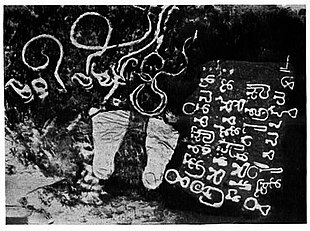 ^ "Ethnologue report for language code: pli". Ethnologue. Retrieved 2018-07-20. ^ a b Sheldon Pollock (1996). Jan Houben, ed. The Sanskrit Cosmopolis, A.D. 300–1300: Transculturation, Vernacularization, and the Question of Ideology, in "Ideology and status of Sanskrit: contributions to the history of the Sanskrit language". Leiden New York: E.J. Brill. pp. 197–199, for context and details, please see 197–239. ISBN 978-90-04-10613-0. ^ P M Scharf; M Hyman (2009). V Govindaraju and S Setlur, ed. 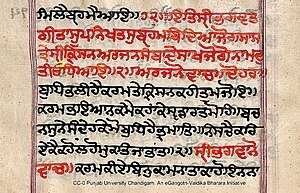 Guide to OCR for Indic Scripts: Document Recognition and Retrieval. Springer. p. 238. ISBN 978-1-84800-330-9. ^ a b c d J.F. Staal (1976). Herman Parret, ed. History of Linguistic Thought and Contemporary Linguistics. Walter de Gruyter. pp. 102–130. ISBN 978-3-11-005818-5. ^ J.F. Staal (1976). Herman Parret, ed. History of Linguistic Thought and Contemporary Linguistics. Walter de Gruyter. pp. 121–125. ISBN 978-3-11-005818-5. ^ John Kelly (1996). Jan E. M. Houben, ed. 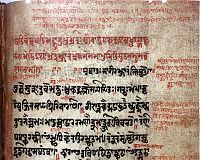 Ideology and Status of Sanskrit: Contributions to the History of the Sanskrit Language. BRILL Academic. pp. 87–102. ISBN 978-90-04-10613-0. ^ Hock, Hans Henrich (1983). Kachru, Braj B, ed. "Language-death phenomena in Sanskrit: grammatical evidence for attrition in contemporary spoken Sanskrit". Studies in the Linguistic Sciences. 13:2. ^ Sheldon Pollock (1996). Jan E. M. Houben, ed. 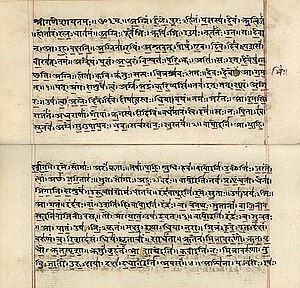 Ideology and Status of Sanskrit. BRILL Academic. pp. 197–223 with footnotes. ISBN 978-90-04-10613-0. ^ a b Cynthia Groff (2013). Jo Arthur Shoba and Feliciano Chimbutane, ed. Bilingual Education and Language Policy in the Global South. Routledge. p. 178. ISBN 978-1-135-06885-1. ^ "This village speaks gods language – India – The Times of India". The Times of India. 13 August 2005. Retrieved 2012-04-05. 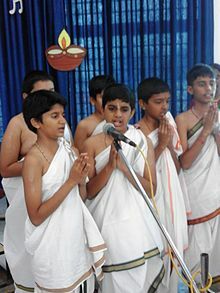 ^ Ghosh, Aditya (20 September 2008). "Sanskrit boulevard". Hindustan Times. Retrieved 2012-04-05. ^ "Orissa's Sasana village – home to Sanskrit pundits! !". The India Post. 9 April 2010. Retrieved 2012-04-05. ^ "Sanskrit second official language of Uttarakhand". The Hindu. 2010-01-21. ISSN 0971-751X. Retrieved 2018-10-02. ^ a b Paul Kiparsky (2014). E.F.K. Koerner and R.E. Asher, ed. 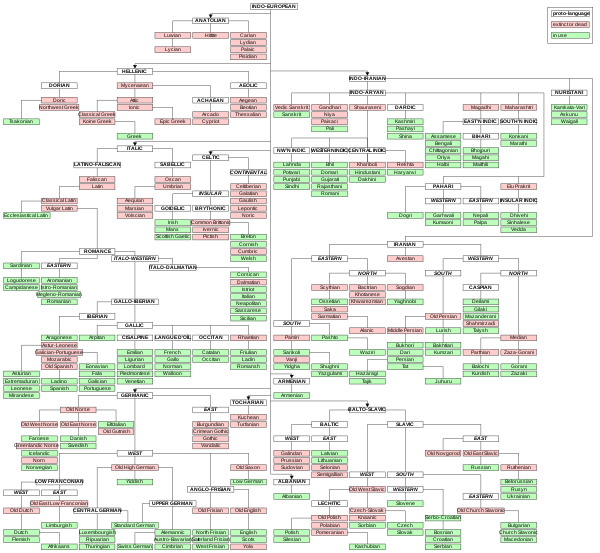 Concise History of the Language Sciences: From the Sumerians to the Cognitivists. Elsevier. pp. 59–65. ISBN 978-1-4832-9754-5. ^ Winthrop Sargeant (2010). Christopher Key Chapple, ed. The Bhagavad Gita: Twenty-fifth–Anniversary Edition. State University of New York Press. pp. 3–8. ISBN 978-1-4384-2840-6. ^ Peter Scharf (2013). Keith Allan, ed. The Oxford Handbook of the History of Linguistics. Oxford University Press. pp. 228–234. ISBN 978-0-19-164344-6. Takao Hayashi (2008). Gavin Flood, ed. The Blackwell Companion to Hinduism. John Wiley & Sons. p. 365. ISBN 978-0-470-99868-7. ^ Paul Dundas (1996). Jan E. M. Houben, ed. 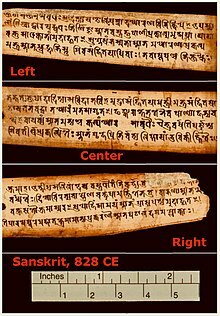 Ideology and Status of Sanskrit: Contributions to the History of the Sanskrit Language. BRILL. pp. 152–155. ISBN 978-90-04-10613-0. ^ "Sanskrit's first Jnanpith winner is a 'poet by instinct'". The Indian Express. 14 Jan 2009. ^ a b Mayank Austen Soofi (23 November 2012). "Delhi's Belly | Sanskrit-vanskrit". Livemint. Retrieved 2012-12-06. ^ "Doordarshan News Live webcast". Webcast.gov.in. Retrieved 2012-12-06. ^ "Indiana Jones and the Temple of Doom (John Williams)". Filmtracks. 11 November 2008. Retrieved 2012-04-05. ^ "The Child In Us Lyrics – Enigma". Lyricsfreak.com. Retrieved 2013-01-27. Hock, Hans Henrich (1983). Kachru, Braj B, ed. "Language-death phenomena in Sanskrit: grammatical evidence for attrition in contemporary spoken Sanskrit". Studies in the Linguistic Sciences. 13:2. Anne Kessler-Persaud (2009). Knut A. Jacobsen; et al., eds. Brill's Encyclopedia of Hinduism: Sacred texts, ritual traditions, arts, concepts. Brill Academic. ISBN 978-90-04-17893-9. Jamison, Stephanie (2008). Roger D. Woodard, ed. 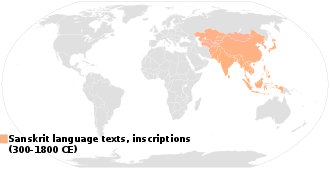 The Ancient Languages of Asia and the Americas. Cambridge University Press. ISBN 978-0-521-68494-1.